If you’ve spent any time at all looking into SEO, you’ve likely heard the term keyword research. But… what is keyword research? If you’ve found yourself asking these questions, you’re certainly not alone. Understanding how to do keyword research can be a challenge. There’s no getting around it, though. Keywords are a critical part of any SEO strategy — so if you miss the mark, your results will suffer. Fortunately, selecting keywords isn’t a guessing game and you need the correct keyword research tools. On this page, we’ll explain the keyword research process, how to do keyword research in 2018, and a few keyword research tips so that you can make data-backed decisions for your site’s SEO strategy. Keyword research is the process of identifying the words and phrases you want to target in your site’s on-page SEO strategy. After all, SEO isn’t just about showing up in search results — it’s about showing up in search results for the keywords that your target audience is searching. So before you optimize your site, you need to know which words and phrases potential customers and clients use when they’re looking for information about your industry, products, services, or business. And keyword research is how you uncover those keywords — making it an essential first step in any SEO strategy. As with any research process, keyword research can take a significant amount of time and effort. So, why is this worth your time? Why can’t you just decide which keywords you want to rank for based on your own understanding of your business and customers? These are both valid questions. After all, if you’re familiar with your industry and audience, spending hours studying words and phrases might sound like a waste of your time. But no matter how well you know your customers, keyword research is an essential step. When you select your keywords based on data, you’ll be more effective in accomplishing a few key goals. Your keywords determine not only the amount of traffic your site can attract but also the quality of that traffic. Visitors who aren’t part of your target audience and are unlikely to become customers or clients are considered low-quality traffic. That’s because they won’t have an impact on your business’s most important goals, like sales and revenue. High-quality traffic, then, is made up of visitors who are part of your target audience and have a high chance of converting. 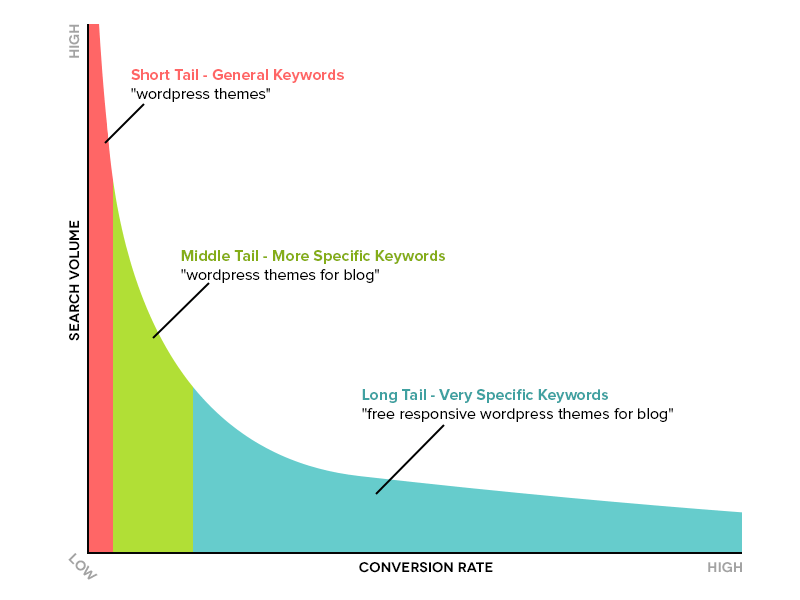 And the keywords you choose have a major impact on which type of traffic your site attracts. When you spend time learning about your audience’s search habits, you can tailor your strategy to cater to the words and phrases they use. This way, you won’t just be optimizing your site for keywords that will generate the highest traffic numbers possible — you’ll be doing it in a way that’s designed to reach users who are likely to make a purchase or become a lead. And while these can attract qualified traffic, most users often don’t use them until later in the buying process. Keyword research can help you uncover the words and phrases that will help you reach them at all stages of the buying process. Most consumers go through the same basic three stages. First, they look for informational content that helps them learn about an industry and what kinds of solutions there are to their needs. Then, they evaluate the companies that provide those solutions and determine which are best suited to what they’re looking for. Finally, they contact those companies for more information or make a purchase. 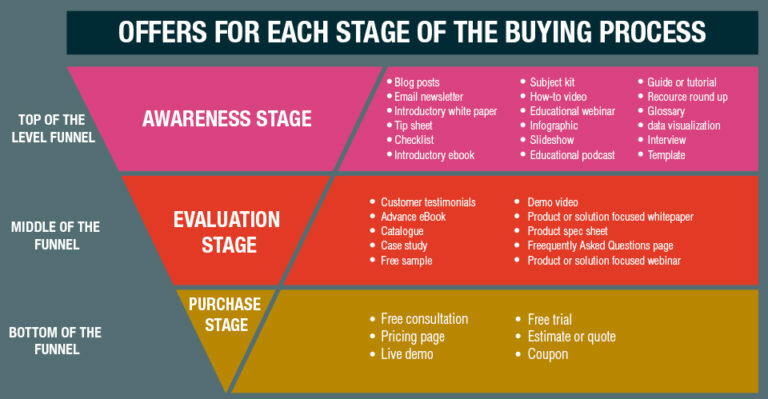 If you only create content and optimize your site for the actions that take place in the last stage, you miss out on being a part of the first two stages at all. This means that you could be losing customers to your competitors, simply because you aren’t part of the research process. But with keyword research, you can learn more about the phrases your audience uses at every stage so that you can create content around all of them — and make it clear that your company is a great choice right from the start. Many of the keywords you discover during the research process will be information-based. These keywords will help you learn more about what your target audience wants to know about your industry, and what information they need before making a buying decision. The most immediate benefit of this is that these keywords will help you create content for the top and middle of your sales funnel. But beyond that, these keywords will help you more effectively address your audience’s needs. For example, let’s say you want to attract more customers to your auto repair shop. But to fill out the top and middle of your funnel, you’d need to identify some more informational keywords. So, let’s say you find that the phrase “how often do I need an oil change” is often searched. In this case, the intent behind the search is clear. Users that are searching this phrase are thinking about getting an oil change for their car, but aren’t sure when they need to do so. To address this question, you could write an article or blog post about the necessary frequency of oil changes, then publish it on your site. Then, when a user searches that keyword and lands on your site, they’ll find a clear answer to their need. This is beneficial for both your business and your audience. Searchers get helpful information for free, and your business gets to connect with a potential customer as they’re actively searching for information. Then, if that searcher realizes after reading your article that it’s time for an oil change, and you happen to be located nearby, they can easily contact you for an appointment. And even if they aren’t ready to take action immediately, you’ve still established your brand as a helpful source of information — so when they do need an oil change or any other auto repair services, your business will stand out as a trustworthy option. Keyword research can be a complex process. But with the following six steps, you can uncover the keywords that will help you reach your SEO goals. To attract quality traffic, you need to use the same words and phrases as your target audience. This requires determining what kinds of topics they search for that are related to your products, services, and industry. One of the best ways to do this is to check out the related searches feature at the bottom of Google’s search results. First, simply search for one of your main target keywords, or a phrase you think your target audience might search. Then, scroll to the bottom of the page and take a look at the related searches. These suggestions are based on real user search data — meaning that they’re what users are really searching for most often. These are the searches that users perform most often when they want to learn more about their options for women’s watches — so for a retailer selling them, this list is a keyword goldmine. Chances are high that your competitors are already using SEO. And while this means that it may be challenging to achieve the rankings you want, it also means that you don’t need to start from scratch when it comes to finding keywords. That’s especially true if you use a competitor research tool like SEMrush. You can enter a competitor’s domain name, then see a report with all of the keywords they’re currently ranking for, as well as the search volume and competition level of each one. If any of the keywords make sense for your business — and many of them should — you can add them to your own list and be confident that you aren’t missing any of the opportunities your competitors have found. An effective SEO strategy requires targeting keywords of varying length and specificity. Some of the easiest keywords to rank for are long-tail keywords, or lengthy phrases with a very specific intent. On the other end of the spectrum, short-tail, or “head” keywords, are short, broad phrases. You can see these types illustrated in the following graph. In general, the shorter a keyword, the higher its monthly search volume. And while this may lead you to believe that these are where you should focus the majority of your efforts, it’s important to recognize that these keywords are often extremely difficult to rank for. 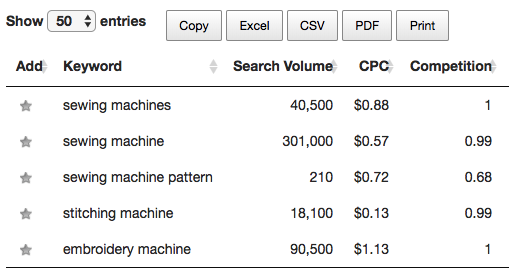 Long-tail keywords, on the other hand, have a lower monthly search volume but will be easier to rank for. Plus, the more specific a keyword, the clearer a searcher’s intent — meaning that these phrases often lead to higher conversion rates. Once you’ve put together a list of potential keywords, you can use metrics like search volume and competition level to evaluate their value for your business. You can access this data using tools like the Keywords Everywhere extension. Copy and paste a list of keywords into the Bulk Upload feature, and you’ll see each keyword’s monthly search volume, as well as its competition level on a scale from 0 to 1. The ideal keyword is one with a relatively high monthly search volume and relatively low competition level. As you evaluate your keywords, you’ll likely find that this is a rare combination — but you can use the data to make informed decisions about where to focus the majority of your efforts. As you research potential keywords, you’ll want to keep a master list of all of your options, as well as key data about each and how you’re using them on your site. While it may seem like an unnecessary step in the beginning, you’ll likely accumulate a few hundred (or thousand) keywords, and this list will become a valuable resource for you and your team. Fortunately, with tools like Keyword Planner, you can easily export your research into spreadsheets, then copy and paste your data into a master tracking document. Then, you can use this document to develop your strategy and track how you implement keywords on your site, as well as the results you see from each. As you build your list of keywords, you’ll likely identify many that require more work than simply adding to an existing page’s title tag to use. Each of these presents a new opportunity for your business — but you’ll need to prioritize them. You can use metrics like search volume and competition level to simplify this process. But beyond that, you’ll need to consider the potential each has for your business’s goals. Focus on keywords with clear search intent, as these are your best opportunities to meet a specific need. The clearer a keyword, the more confident you can be that your content will be exactly what searchers are looking for — and that you’ll be able to but connections that ultimately translate into sales. Finding and evaluating keywords for a website can be a challenging task. 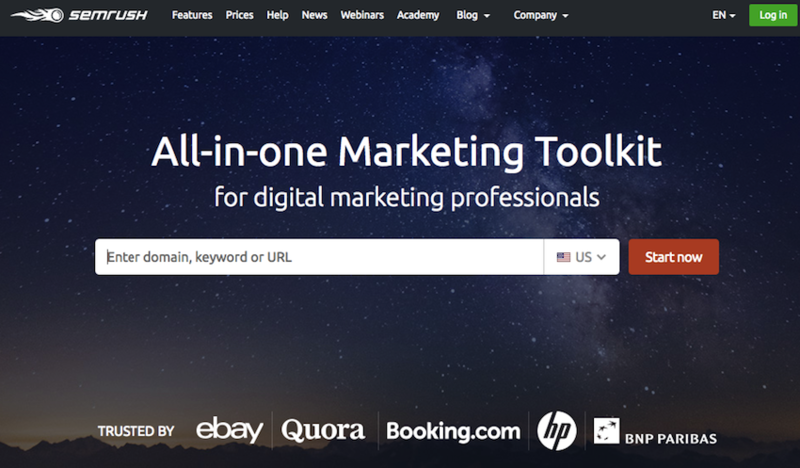 Fortunately, there are plenty of tools you can use to find the best keywords for your business. Here, I’ll go over six of them. 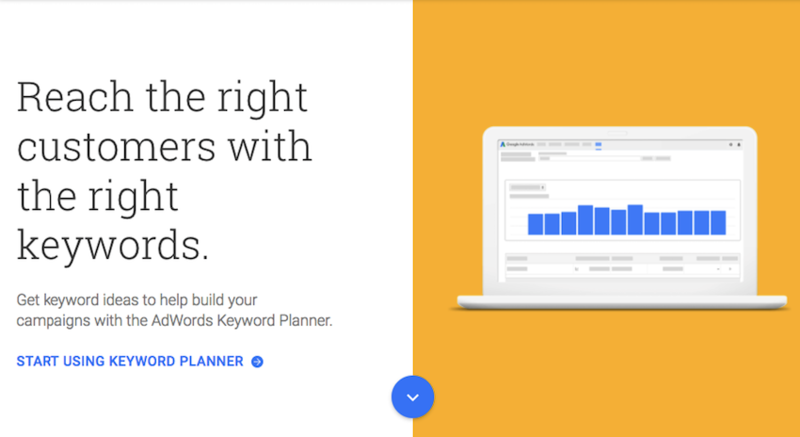 Keyword Planner is Google’s keyword research tool intended for AdWords users. It used to be freely available to everyone but is now only available to advertisers running ad campaigns on the platform. But if you’re already using AdWords (or are willing to run a campaign for the sake of gaining access to Keyword Planner), it can be an extremely helpful tool in the keyword research process. You can use the tool’s “Find New Keyword” function to uncover potential keywords based on a list of topics and ideas. 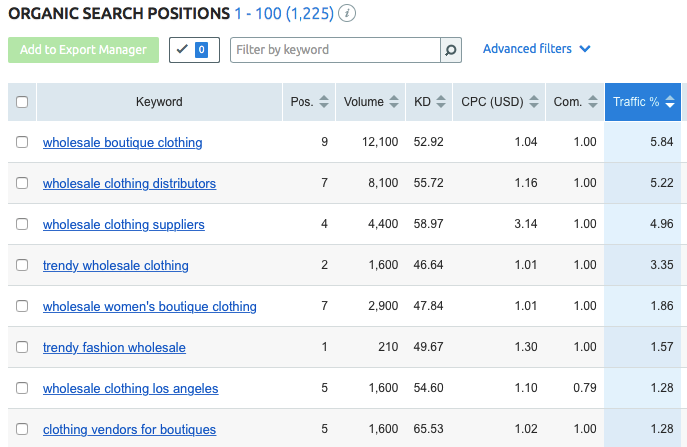 Then, you can access search volume and competition data for each of the keywords on your list. 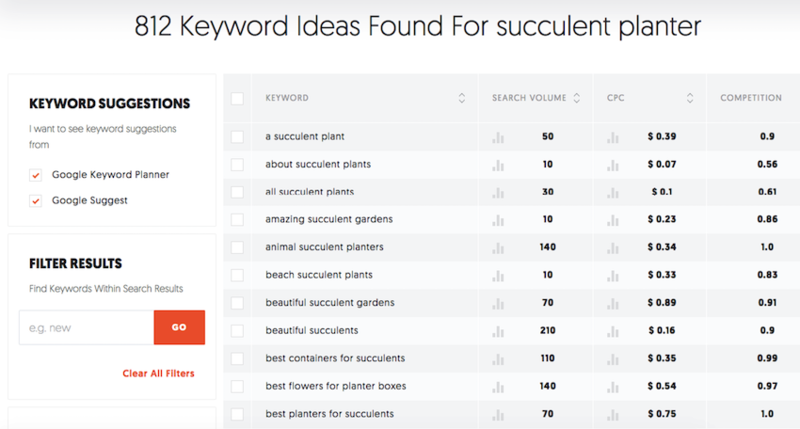 Ubersuggest is a free keyword research tool you can use to identify relevant keywords and phrases to target in your SEO strategy. Enter a basic keyword or phrase, and you’ll see a list of ideas based on Google’s suggested search data. Then, you can add any relevant keywords to your list and repeat the process for other topics related to your business. Keyword Tool is another popular option for finding long-tail keyword suggestions based on Google Autocomplete data. 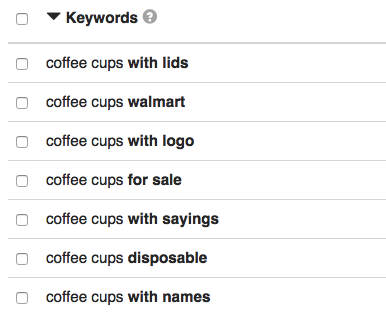 Enter a keyword, and you’ll see a list of potential long-tail keywords based on user search data. 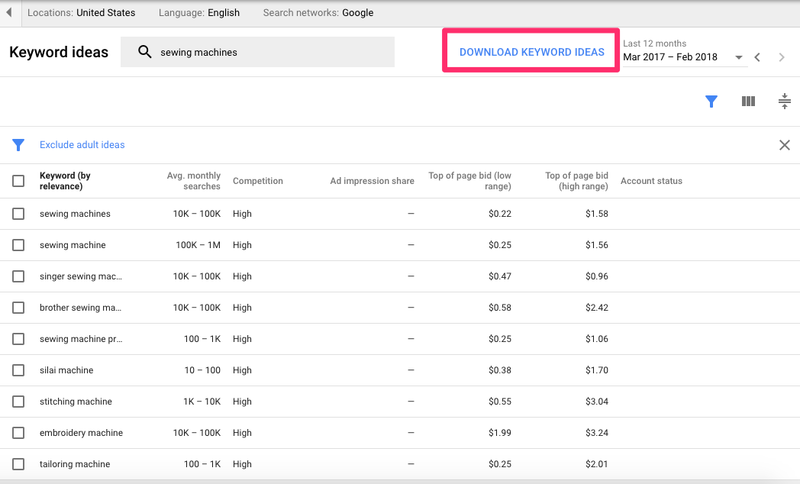 Search volume and competition level data is only available in this tool for users with paid plans, but you can easily copy and paste your list into other tools for more details on each keyword. SEMrush is one of the best tools available for competitor research. Enter a competitor’s URL, and you’ll be able to see each of the keywords they’re ranking for, as well as where they rank on the results page. 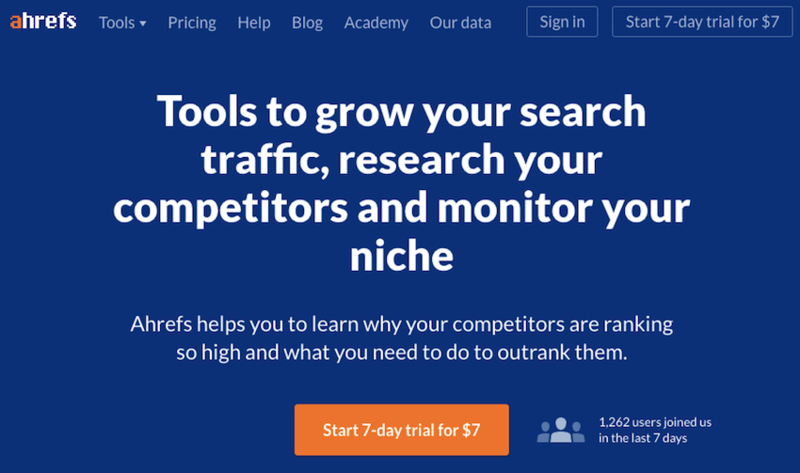 Ahrefs is best known as a backlink analysis tool, but you can also use it for competitor research. Search a competitor’s domain, then click “Organic keywords,” and you’ll see a list of each keyword the site ranks for. Repeat this process for each of your main competitors, and you’re almost guaranteed to uncover a wealth of opportunities for your site. Moz’s Keyword Explorer offers a wealth of data that can help you with the keyword research process. Start by searching for one of your target keywords, and you’ll see an overview of that keyword’s volume, difficulty, opportunity, and potential, as well as a SERP analysis and a list of related keyword suggestions. If you’re looking for in-depth analysis of the keywords you’re considering, this is one of the best ways to find it. How Do I Find Keywords in Google Analytics? 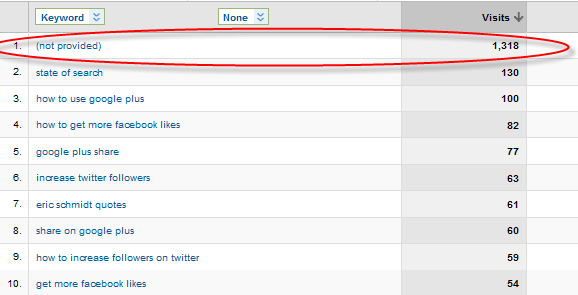 Google Analytics used to provide a full report of the keywords users searched before landing on your site. This was a helpful way to see the types of keywords that were valuable to a site so that SEOs could use that insight to select similar keywords. Unfortunately, that’s no longer the case, and many keywords appear as (not provided) in Analytics reports. But while accessing this information is no longer as simple as opening a report, you can still take steps to identify how users are finding your site. For more information, check out our blog post with six ways you can unlock your (not provided) keywords and learn more about your visitors’ search habits. Keyword research is an essential step in the search engine optimization process. It’s the best way to ensure that your strategy attracts qualified traffic, since the keywords you select will have a major impact on the visitors your site earns. A comprehensive keyword research strategy will also help you reach searchers at every stage of the buying process and address your audience’s needs and questions. And to be clear, this can be a time-consuming process. You’ll need to identify the most important topics for your business, use keyword tools to collect data, consider metrics like search volume and competition, and select a mix of short- and long-tail keywords. But if you follow the steps on this page, you can be confident that you’re optimizing your site for keywords that will help you reach your marketing goals.